It is usually up to doctors and midwives to deliver babies, but they are hard to find in mid-air. Luckily for one woman who prematurely went into labor at 42,000ft, the Turkish Airlines cabin crew was more than up to the task. Shortly after take-off on a flight from Guinea to Burkina Faso, passenger Nafi Diaby, 28-weeks pregnant, began suffering from labor pains, forcing the cabin crew and fellow passengers to spring into action. Thanks to the quick actions of the crew, Diaby gave birth to a baby girl, who she named Kadiju. Both mother and child were taken to the hospital when the Boeing 737 landed at its destination, Burkina Faso’s capital, Ouagadougou. 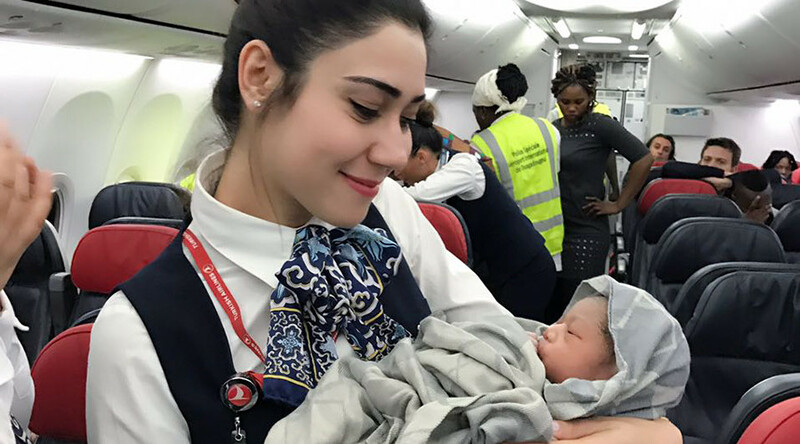 Delighted with the birth of Kadiju, who was eight weeks premature, Turkey’s national air carrier posted pictures on social media welcoming her to the world and congratulating the crew members. In a press release, the airline confirmed that both mother and baby are being cared for in the hospital and are both doing well.